So, famously, said Laura Ingalls Wilder, author of the Little House on the Prairie books, and it's a saying I'm rather fond of. 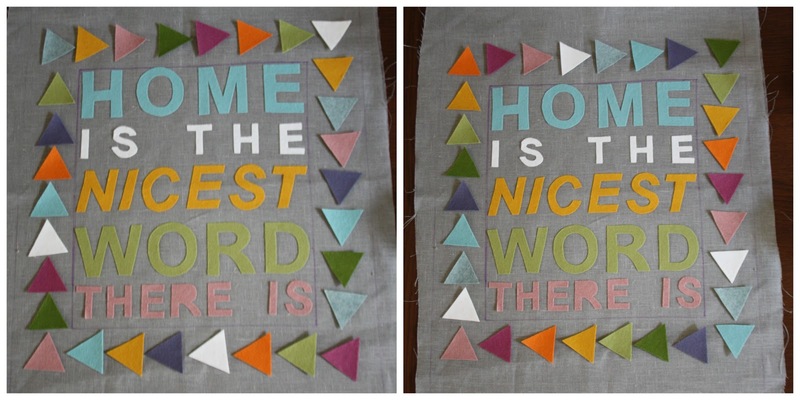 I began making this wall hanging last summer and spent some time researching (ok, googling) different quotations about home and what makes home so special. There are loads. This is our happy place/space. But they were discounted for being not quite right, too Wizard of Oz, too sweet. (Taste is a funny thing - one persons cliche is another's mantra.) I very much liked this quotation, by Jane Austen, "There is nothing like staying at home, for real comfort." but it was too long. Too much sewing to do there. And so I finally fell upon the one you see above and it works - for me - because, simply, the words ring true. That's the thing about cliches, they're usually right. Once I'd chosen my words I traced the letters from Word onto Bondaweb (fusible interfacing) then arranged them on a piece of grey linen which I bought very cheaply in IKEA some time ago. I played around with colours and chose some nice wool/acrylic mix felt which I thought looked good against the grey. Then I carefully cut and arranged my felt letters before ironing them in place, using a ruler and a fading ink pen to try and get the lines as straight as possible. ...and secured them using a straight stitch around each letter. I wont lie, this took a while, but I love hand sewing and found this work very therapeutic. I'd decided to edge the words with lots of coloured triangles. I don't really know why, I think I'd just finished my Cornwall Holiday Embroidery and wanted something clean and geometric looking after all that detailed embroidery. Then I spent some time faffing around with the arrangement before putting it away for months and focusing on other things. I got it out when we knew we definitely had the house. Suddenly, I had to finish it and after more faffing with the felt triangles, I decided on this. Three clusters of three pointing up, and three pointing down. And yes, I know it's not perfectly straight, but it's homemade so it's allowed to be wonky, and that linen was slippery to work with! The ones at the bottom (don't laugh) sort of represent the sea and the South Downs, which now form my local landscape. While the ones at the top are a bit like snow-capped mountains, which is my own little joke because John and I say our house looks like a ski-chalet, with it's crazy sixties angles and slopes. Also, I am a bit obsessed with all things mountainous and Alpine lately. Honestly, I'm dying to see what our house looks like in the snow! It's my own way of personalising this well-known quote and making it my own, for our home. Finally, I hemmed the length of fabric and left gaps top and bottom to insert two lengths of wooden dowel to weigh down the linen so that it hung nicely. I wanted the wood to be visible but I recently saw this clever way of hiding the dowel at Jooles' blog Sew Sweet Violet and will bear it in mind for the future. John drilled little holes at either end through which I threaded and knotted some thin cord to hang it from. Currently it's with us in my parents' spare room but eventually I think it will have to go in our new lounge, preferably above a wood burning stove, with a light snow falling outside and a mug of gluhwein or hot chocolate to hand. Love it. I wish I was crafty. It's beautiful. Your creations always are. Your new home is going to be the nicest! I am new here. It is a beautiful work! Yes home is the best. I was watching a film this afternoon that the little boy said " East, west, home'so the best ". Well done Gillian. This turned out so well and was worth all of the hard work. Enjoy it as it hangs in your new abode! So pretty - perfect for your new house !! It's beautiful! And you know - before I read your explanation for the triangles, I thought "This looks like a row of snow-capped mountains mirrored in water." Perfect for your new home. Well done you on a really personal make. It's beautiful, and a perfect gift to give your new home. It's lovely Gillian, beautifully neat stitching and lots of it too! Have a great week. It's beautiful and the sentiments are perfect! A lovely wall hanging. The triangle arrangement is really good, especially for what it means to you. What a perfect project for you right now Gilian! i have been thinking of doing a wall hanging for my daughter's room and that fusible bonding stuff is something I'll have to remember. But also amused because one of the main things I remember in our 60s home (in the late 60s/early 70s) was that my mom made a couple of wall-hangings using some very typical colours much like yours! Later she made another one depicting the pretty (half-timbered) house where my first flat was (under the roof), so I still have that and then much later we ended up buying a small house that is also half-timbered :). She also made my middle daughter a great wall-hanging of the Owl and the Pussycat… so glad you're doing these crafts, as I'm "only" a knitter! I'm not a craft person at all, but even I think this is eye-catching and rather lovely! You are so desperate for snow in your new house; what if you move in in May? Will you be patient? It's beautiful, Gillian! I know it will look lovely hanging in your new home soon! Nicely done :o) Although I reckon chocolate and wine give home a run for its money. It's lovely and so apt now you have your new home. I like the words because they are your words, if that makes sense! I love this Gillian, it's gorgeous, and very you. Such a lovely saying too and one that I had never heard before. In fact after reading your post, I spent a good half hour on Wikipedia learning all about Laura Inglis Wilder! This is so lovely and the quote is spot on, I think it will look fabulous in your new home.